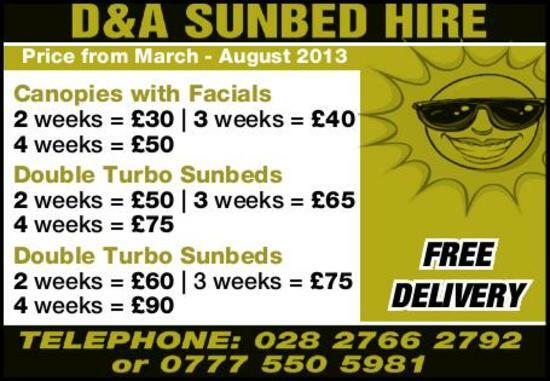 D & A Sunbed Hire has been providing a mobile tanning service to customers across County Antrim and surrounding areas of Northern Ireland. We operate a flexible service that allows you to rent a sunbed at a time to suit you. So whether you are looking to top up your tan for the summer or want to catch a few rays before going on holiday, D & A Sunbed Hire can help. With over 17 years' experience, we are a company that you can trust as we take safety very seriously and keep all of our equipment in excellent working order. 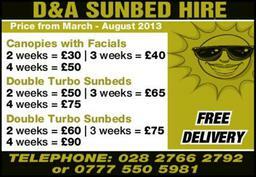 Why choose D & A Sunbed Hire? We are members of The Sunbed Association.